BELLEVUE, WA. — Former Seattle Seahawks quarterback, Jim Zorn, will be signing autographs from 11:00am-12:30pm on Saturday, November 8, 2014 at the Sports Authority-Lakeside Holdings located at 44 Bellevue Way NE in Bellevue, WA. Jim will also be signing autographs from 1:30pm-3:00pm at the Lynwood East location. Photo shows former Seattle Seahawks QB Jim Zorn speaking in a 2013 interview about his career. 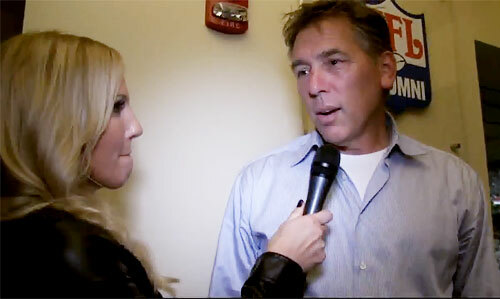 Watch Jim Zorn speaking about his career in a 2013 interview. Watch retired Seattle Seahawks players Jim Zorn and Steve Largent sign autographs for fans on Fan Appreciation Day at Touchdown City in the Event Center of CenturyLink Field before the kickoff of the Seattle Seahawks vs St Louis Rams game on December 23, 2013. The Seahawks clinched the NFC West. Zorn was a left-handed quarterback, and is best known as the youthful and charismatic leader of the (then-expansion) Seattle Seahawks for their first seven-and-a-half seasons. He was the quarterbacks coach for the Seattle Seahawks in the 2007 season. He was hired by the Washington Redskins to be their head coach starting with the 2008 season and remained head coach until being fired in the early morning of January 4, 2010, the day after the final game of his second season as coach. Shortly thereafter, Zorn was hired as quarterbacks coach of the Baltimore Ravens. Zorn was released as quarterbacks coach of the Ravens on January 27, 2011. He was added to the Kansas City Chiefs coaching staff on February 15, 2011.